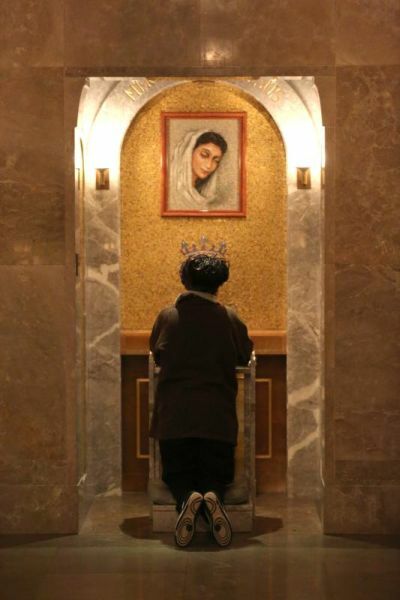 A woman prays in front of an image of Mary March 1 in the Crypt Church at the Basilica of the National Shrine of the Immaculate Conception in Washington. Appreciating artistic beauty leads to an experience of contemplation as “a gaze of faith, fixed on Jesus.” (CNS photo/Bob Roller). Think of the last time you read words on a page or screen. Perhaps it was the headline news, a newspaper column, blog post or online article, your email or Facebook page. Images and sounds were mostly likely part of that experience. We live in a visual culture. Images and sounds flood daily life from our waking moments to the day’s end. What is the place of sacred images in worship, faith formation and the spiritual life? How might we discover or re-discover the beauty of faith expressed in art? Here is one practical approach that adapts the ancient monastic practice of “lectio divina” to appreciating works of art as an aid to worship and prayer. “Lectio divina” literally means “divine reading,” or “holy reading.” Strictly speaking, “lectio divina” is a Christian spiritual practice that focuses on the reading of sacred Scripture. It traces back to the early monastic tradition when monks and nuns used stages or steps of “lectio divina” to read, reflect and live God’s word within the monastic rhythm of prayer and work. Four traditional steps — “lectio,” “meditatio,” “oratio” and “contemplatio” — of “lectio divina” are being rediscovered today as a fruitful path of prayer. “Lectio divina” is a prayerful, reflective reading of the word of God as divine revelation, as the very “speech of God,” as stated in the Catechism of the Catholic Church (No. 81). Practicing “lectio divina” rests on the conviction that “the word of God is living and effective” (Heb 4:12). The first step, “lectio,” invites us to a slow reading of God’s word. This takes some getting used to as it is the opposite of the “speed reading” we are accustomed to today. What do I see? Which Gospel stories or figures are depicted? Who is the main subject? The secondary scenes and subjects? Who is in the background, the foreground? And what is being conveyed through the artists’ use of light, color, line and movement? The second step — “meditatio” or prayerful meditation on God’s word — is a silent pondering of God’s word. The Christian tradition has always looked to Mary, the mother of God, as she “kept all these things, reflecting on them in her heart” (Lk 2:19). As the catechism notes, “to meditate on what we read helps us to make it our own by confronting it with ourselves. Here, another book is opened: the book of life. We pass from thoughts to reality.” (No. 2706). In “meditation,” one moves from the “what” and the “who” to the “why” of the artistic masterpiece. Pondering with the “eyes of faith” now we look to the mysteries of faith presented in visual form. If the image is a Gospel scene, begin with the Scripture passage it evokes. Moving between the sacred text and its visual representation in a silent pondering of word and image draws mind, heart and will into the beauty of faith. Identify key artistic symbols and reflect on their meaning in the light of God’s word. “Oratio,” or prayer, is the third step of “lectio divina.” Now the divine word meditated on turns into prayer. The mind’s pondering becomes the heart’s spontaneous offering rising to God in praise, thanksgiving, intercession or petition. When applied to appreciating art, “oratio” turns the mind and eye from visible beauty to the invisible God, the divine artist and source of all that is true, good and beautiful in the world. From the heart’s depths arises a hymn of praise and thanksgiving for the gift and beauty of faith in visual form. A fourth step of “lectio divina” is contemplation, a fixing of one’s inner gaze on Jesus Christ. This quiet and trusting rest in the presence of God is a silent abiding under the gaze of God’s merciful love. Simply being in God’s holy presence rather than doing is the goal. Receptivity to God’s grace and openness to the transforming power of God’s word replaces anxious, self-sustained effort. “Words in this kind of prayer are not speeches; they are like kindling that feeds the fire of love” (Catechism of the Catholic Church, No. 2715-2717). With “lectio divina,” one moves from seeing to contemplation to praise of God. It is in seeing with the eyes of faith that sacred art evokes and glorifies “the transcendent mystery of God — the surpassing invisible beauty of truth and love made visible in Christ. … (For) genuine sacred art draws man to adoration, to prayer and to love of God” (Catechism, No. 2502).